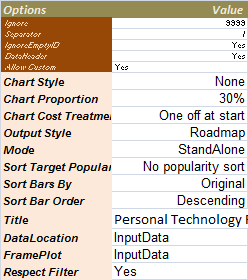 Elsewhere on this site, I take you through the development of a roadmapper in Excel. Looking at the pattern of use, it seems that may visitors to this site just want a roadmapper to download and use (as opposed to following along with the creation of the VBA required to create one). This is a quick user guide for those that want to use the roadmapper right out of the box. I hope you find this free roadmapper tool useful - if so please +1 this site, join our forum, comment on the blog, follow me on twitter etc. etc. If you show enough interest I will develop it further. You can download the Excel roadmapper here. Nowadays it's in the cDataSet.xlsm workbook. There is also a Google Apps version. There are two simple pieces of information needed to be able to create this. This is the data that created the roadmap above. There is one line for each shape on the roadmap. If a callout is required it is described on the same row under the same row using the callout column. More about that later. In the following discussion, an item refers to the shape and data described by 1 row of this sheet. The columns don't need to be in this order, and not all are manadatory. This uses the cDataSet data Abstraction library so the data is simply terminated by a blank line & blank column. Description. Any text here will appear on the roadmap shape for this item. ID. Each item must have a unique ID of some sort. This is referenced by the target column. Target. If an item, or series of items transition to some other thing (the usual purpose of a roadmap is to show this transition), the the target should contain the ID of the item it will transition to. For example, in the example above, the mac and netbook transition to the iPad. Custom. The roadmapper has standard default behavior set up in your parameter sheet. However you may want to customize this behavior for some or all items. This will allow you to change formats and shapes and many other options. Cost. The roadmapper is capable of producing an attached chart that shows the cost of a roadmap over time. This optional field allows you to provide costs if you need them that will be used in the cost of ownership chart. Callout. Sometimes there is not enough room to describe an item, or you need to call them out for special attention. If you have some text here, a call out including that text will be created using the parameters selected in the custom field to position and format the callout. Sequence. 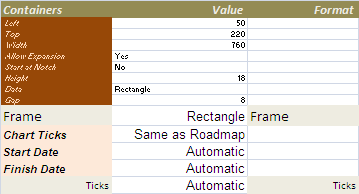 The roadmap can be sorted vertically in a number of ways, selectable in the parameter sheet. One of them is to use the sequence field which you can fill with whatever you like if you need a particular order that cannot be achieved using the normal sort options. Left. Top, Width. These specify the placement and dimensions in pixels of the overall roadmap relative to the sheet it will be plotted on. Allow Expansion. Normally a 'target' will expand to accommodate all the items that are transitioning to it. If a target only has one item arriving, you may want to keep the target and the item the same size. Setting this to No will accomplish that. This is the default and can be overridden with a custom definition. Start at Notch. If you are using a chevron shape, or some other shape with a 'tail', this parameter allows you to fit them into each other. Setting this to Yes will accomplish that. This is the default and can be overridden with a custom definition. Data. This is the default container shape for a data item. 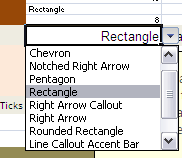 You can set it to any of the valid shapes in the dropdown list.This is the default and can be overridden with a custom definition. Frame. This is the shape that goes round the entire roadmap. It has the same values as Data, above. You can also set the format column of this parameter to the format you would like to use for the background color, justification, text etc. of the frame. Just set it using the normal excel formatting tools and it will transfer that to the shape. Chart Ticks. As mentioned it is possible to create a cost of ownership chart. Right now this value only has one value - 'same as roadmap'. 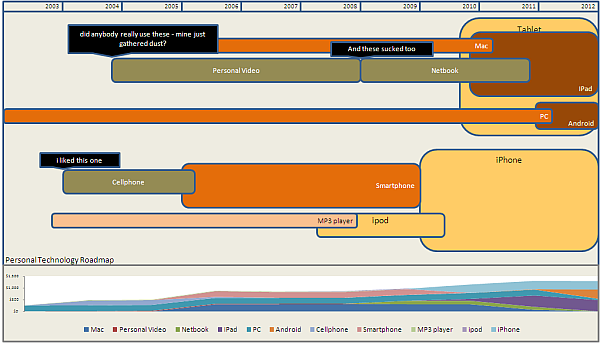 In a future version this will allow a different granularity for the chart than the roadmap. Start Date, Finish Date. These are the dates that the roadmap should run from and to. 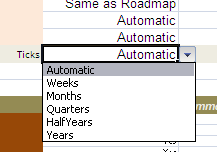 If you select automatic, it will select suitable values based on the dates of the data and the tick scale selected. Ticks. This specifies the scale to use for ticks (dates to show along the top of the roadmap. If you select automatic it will choose something optimal based on the start and finish dates. You can also set the format column of this parameter to the format you would like to use for the background color, justification, text etc. of the frame. Just set it using the normal excel formatting tools and it will transfer that to the shape. These are parameters that refer to the behavior of the roadmapper in general. Separator. This value is used as a separator in the Target Column. For example if the value was "big,small,medium" and the separator was ",", then "big" would be treated as the target. IgnoreEmptyID. All items require a unique ID. If this is set to yes, then rows with no ID are ignored, otherwise an error is flagged. Allow Custom. If No, then any data in the custom column is ignored. If yes, then the custom parameters referred to by the custom name are used for this item. Chart Style. This defines the type of chart to use for the supplemental cost of ownership chart. Chart Cost Treatment. This defines how to treat the cost that is shown in the Cost column when including a cost of ownership chart. Output Style. For now the only valid value is Roadmap. In a future version there will be the possibility of exporting to other systems and formats. Mode. To create a roadmap, the only valid value is "Standalone". 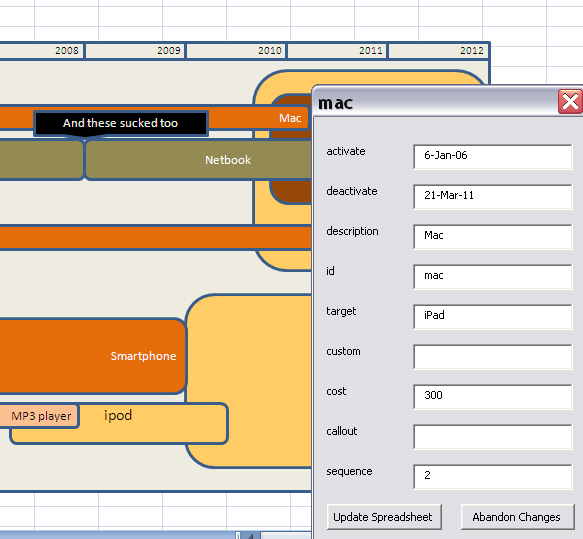 The roadmapper logic has been embedded into other worksheets, for example to create roadmaps from a database. In that case this parameter is to be used to modify the behavior of the roadmapper logic so it knows it is being used in an embedded way. Sort Target Population. It is possible to sort the roadmap so that the targets which attract the most items appear closest to the top or the bottom. Sort Bars by. This allows you to select which column to use to sort the shapes within their respective targets. Original means the order they appear on the sheet. Duration is the calculated elapsed time of the item. Sort Bar Order. This defines the order of 'sort bars by'. Title. Will appear on the roadmap container. Respect Filter. Whether to respect any autofilter in place in the source data. Shape. The shape to assign to this item. Can be any of the known roadmapper shapes. Allow Expansion. Normally a 'target' will expand to accommodate all the items that are transitioning to it. If a target only has one item arriving, you may want to keep the target and the item the same size. Setting this to No will accomplish that. Gap. Space in pixels to allow vertically between shapes. Start at Notch. If you are using a chevron shape, or some other shape with a 'tail', this parameter allows you to fit them into each other. Setting this to Yes will accomplish that. Format. You can set the format column of this parameter to the format you would like to use for the background color, justification, text etc. of the shape. Just set it using the normal excel formatting tools and it will transfer that to the shape. Callout. This defines the shape to use as a callout for this item. None means no call out. Any known roadmapper shape can be used as a callout. Callout Position. This is the position relative to the shape, that the callout should be positioned at. Callout Format. You can set the format column of this parameter to the format you would like to use for the background color, justification, text etc. of the callout shape. Just set it using the normal excel formatting tools and it will transfer that to the shape. Callout % Height. The callout is placed this %age of the height of the item shape above it. Callout % Width. How wide to make the callout relative to the item shape. There are 3 status values for date aware shape parameters. 'current', 'recent' and 'old'. Most of the entries are the same as for the custom rows, except for some date definitions. Roadmap Colors. One row for each of 'current', 'recent' and 'old'. Decommission from/to. Any items that are deacrivated during the periods specified by these dates will be assigned the parameter values from this row. In the example workbook, there is a button assigned to the procedure 'roadmapper'. This will assume that the parameter sheet is called 'parameters'. If you need to change any of that behavior you can modify some of the parameters in the vba module to whatever you need. Modifying the data through the roadmap. You will have seen this chart referred to in a the discussion on parameter sheets earlier. Here is a roadmap with such a chart appended. Ultimately, many of these roadmaps will be used in powerpoint or otherwise copied from Excel. To make this easier, all the shapes are grouped into one,so you can just select the roadmap frame and copy it. When you paste it to another office program, it comes across as grouped shapes so the can be manipulated as required, however to maintain recreatability, I recommend you simply get your parameters right and create the end product in Ecxel, then just paste it over as an image.